Now, please check if auto-fill is working or not. The posts on “cell drag-and-drop” are interesting. I read those posts on facing the problem of frequent deactivation of “cell drag-and-drop”. I also found that the feature is getting disturbed after opening, working and saving a Macros enabled Excel file, as some reader had pointed out. I observed this on saving files in Excel Utility for filing ITRs (this Excel Utility does not allow cut-paste or copy-paste while filling ITR Form) . I want to share two points on “cell drag-and-drop” in Excel 2007 with readers (I am not sure if they have any significance today; I mean after so many years of use of Excel2007). (1)	“cell drag-and-drop” will not work if a Filter is applied to the Data even though the “Fill Handle and Cell drag-and-drop” box is checked. It is rare that “cell drag-and-drop” is applied to a filtered data; yet there may be occasions when one forgets the filtration. 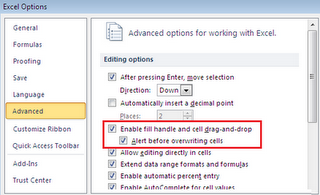 (2)	The behavior of “cell drag-and-drop” is dependent on the type of format applied to the cells in a worksheet. Numerical values in a cell are copied as such on dragging the selection by holding the handle; i.e. if the cell A2 contains 2 with number format, 2 is copied to the adjacent cells as one drags. On the contrary if the cell contains a date or a number with text format, the date and number get incremented by 1 as one drags, i.e. 21-08-2015 becomes 22-08-2015, 23-08-2015 … so on; similarly 1 becomes 2, 3 …; 001 becomes 002, 003 …; 0.1 becomes 0.2, 0.3 ..; 0.01 becomes 0.02, 0.03 … as one drags. So, the RIGHT FIRST number gets incremented. So one has to judiciously use the “drag and drop” or “copy-paste” facility on numbers and dates in data. I cannot get excel 2013 to drag and drop or even allow me to select more than one cell to copy. I get the plus sign in the lower right corner but it will not allow me to do anything and I checked the options/advanced/”cell drag-and-drop” and it is checked. I tried unchecking it and the plus sign doesn’t appear so I rechecked it. It still does not work. Any help? THANKYOU SO MUCH!!! IT WAS THE FILTER, NOT THE OTHER FEATURES. Thanks for this valuable information Ashok, I used the filter and then tried to use this cell drag-and-drop option, I wasted so much time trying to understand why this didn’t work, Ur post helped me, Thanks a lot…. Thank you , Its a great solution to an old problem in my laptop. Hi, can you please download a sample excel file from and let me know if you see the same problem in this file as well? According to me, probably there are some macros installed on your sheet which can be leading to disabling of this feature. Does this happen for every file or just one? Sometimes it’s the file created which has a issue that doesn’t allow saving this option permanently. I would recommend opening the file in excel, set this option and then save as a new file. Let me know how it goes. Thanks buddy, you have solved my problem too…. Thanks a lot dude !! Thank you! This worked exactly! hi..cn u tell me without using mouse hw can we drang n drop the table. is der any short-cut key for that. There’s no shortcut for drag and drop but what are you trying to achieve? Do you want to extend the table or move it completely? Thanks!!! When you convert any Excel file into XML format, that option will atomatically unchecked. Hello Parag, maybe you are right but I think this behaviour cannot be isolated to that scenario only. I have faced the with normal excel files as well. Hi, Today i was in really big problem when nearabout 30K entries needs to be corrected and filtered out some data suddenly my drag and Drop and autofill was not working.. but your post really helped me to come back on time. Thanks a lot! It saved my lots of time. Thank you, I was going crazy trying to work out how to get this working again. Awesome!!! Article helped me to resolve the cursor issue i was facing. Thanks!!! Thanks a tonne! I wasted 2 hours initially.. but saved the entire day! Works like a charm. Thanks! Just curious to know if you or someone knows why the option go missing. Thanks a lot, keep posting as many solved problems u can. Thank you so very much! This occurred to my Excel while in a work book sent to me that has “add-in” features. I will be working in it again, other issues with it not working, or it could be me? However if it occurs while I’m in it would you like me to let you know? Thanks for figuring out the fix! Yes sure, let me know! thanx my problem is solved….. I checked the boxes suggested and the function still does not work. You are the first one to say so. Do you have any additional plugins that might be blocking this? I am having the same problem but only in a spreadsheet that I’m currently working i, if I open a new excel spreadsheet, the drag and drop works. I’d hate to have to recreate the spreadsheet as it has lots of data. Any ideas and\or solutions? Thats strange! I am sure you have tried this already but still I am going to say it, but still…does copy pasting ur entire sheet to a new one solves your issue? You can also try saving the file with a new name and in the normal mode (and not in compatibility mode). I’m working in Excel 2010 and not in compatibility mode. I saved a copy to 97-2003 and still received the same results. Note: the “Enable fill handle and cell drag-and-drop” box has always been, and sitll is, checked. Here’s some good news. I tried, once again, to perform a drag and drop in a test file and the results were the same but this time, I saved the file without deleting the columns with the data as I had always done before and when I reopened the file, to my amazement, the calculations were correct. I went to my main file and tried it there, received the same results, closed and reopened the file; YES, the calculations are now correct. This, of course, is a work around but it works; if you have any ideas as to why the drag and drop is not working as it should and how to fix it, please let me know. Thanks. Cant really tell unless I have a look at your test excel file and the scenario myself. Weird I too am experiencing the same. Have adjusted the settings, but drag and drop still does NOT work. I will attempt to copy and paste. Do you have appropriate permissions on the workbook? Also you might want to check out the explanation provided in the earlier comments. Maybe it helps. For some reason my Excel quit allowing me to drag the formula and this solved the problem. Thanks a lot! You’ve saved me a lot of time. Hhmm… in my case it’s not maintaining the different, eg. if I enter 50 and 100 in the first 2 rows I was expecting the dragging to complete it with 150, 200, 250, etc but in my case I’m getting 51, 101, 52, 102, 53, 103, … any idea why that could be and where to change it? I was really upset by deactivation of this feature when I got new laptop with excel 2010. Thanks buddy for your nice support. Thank you for this info. It was working earlier and not sure what I changed in settings it stopped working. This page gave me the info I needed to enable it again. Thanks a lot, Problem Solved….. I Guess Some XLS docs disable this option – when we choose to enable the macro in the docs. Thanks for the handy tip. Thanks. It helped me a lot. Sometimes, if basic things doesn’t work, we go pissed off. This link helped me in time. Thanks a zillion for the same. With drag and drop, the background colour may change, anyway to disable this, as all I want to do is copy a formula. I think you cant disable this while drag-drop but what you can do is after you have done your drag-drop, you can try selecting the new cells and the click on Clear Formatting. May be this will help you out! Thanksssssss A LOT … I got really crazy and become so helpless and thinking 2010 to be useless in front of 2003 version.. Thanks, its pretty crazy, it was the same in my system as well!